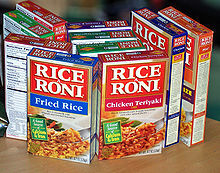 An assortment of Rice-A-Roni boxes. Rice-A-Roni is a product of PepsiCo's subsidiary the Quaker Oats Company. It is a pilaf-like boxed food mix that consists of rice, vermicelli pasta, and seasonings. To prepare, the rice and pasta are browned in butter, then water and seasonings are added and simmered until absorbed. In 1895, Italian-born immigrant Domenico ("Charlie") DeDomenico moved to California, where he set up a fresh produce store. A successful businessman, he married Maria Ferrigno from Salerno, Italy. Back home, her family owned a pasta factory, so in 1912 she persuaded him to set up a similar business in the Mission District of San Francisco. The enterprise became known as Gragnano Products, Inc. It delivered pasta to Italian stores and restaurants in the area. DeDomenico's sons, Paskey, Vince (1915–2007), Tom, and Anthony, worked with him. In 1934, Paskey changed the name to Golden Grain Macaroni Company. Inspired by the pilaf recipe she received from Mrs. Pailadzo Captanian, Tom's wife, Lois, created a dish of rice and macaroni, which she served at a family dinner. In 1958, Vince invented Rice-A-Roni by adding a dry chicken soup mix to rice and macaroni. It was introduced in 1958 in the Northwestern United States and went nationwide four years later. Because of its origins, it was called "The San Francisco Treat!". After a trip to Italy in 1964, Vince returned with the idea for "Noodle Roni Parmesano", based on the classic Noodles Alfredo. As the product line extended with other shapes and sauces it was renamed from Noodle Roni to Pasta Roni in 1995. In 1986, Quaker Oats Company purchased the Golden Grain Company from the DeDomenico family. In 2001, the Quaker Oats Company was purchased by PepsiCo. American Italian Pasta Company bought the Golden Grain brand in 2003, but the sale did not include Rice-a-Roni, which remained with the Quaker Oats division of PepsiCo. ^ Finz, Stacy (July 16, 2006). "RICE-A-REDUX / After a 7-year hiatus, it's billed once again as the San Francisco treat". San Francisco Chronicle. ^ Sherrod, Pamela (June 14, 1986). "Quaker Oats To Purchase Golden Grain". Chicago Tribune. ^ Roth, Stephen (January 18, 2004). "American Italian Pasta will turn inward after $43M purchase". Kansas City Business Journal. This page was last edited on 7 January 2019, at 04:59 (UTC).